There was a lot of attention in the media last week given to a legal challenge to FATCA and also to Democrats Abroad’s official response. We thought it would be helpful to articulate the key takeaways from these events. GOP presidential hopeful Rand Paul is one of six plaintiffs to file suit against the Obama administration challenging the constitutionality of FATCA (the Foreign Account Tax Compliance Act). Lead attorney for the plaintiffs James Bopp Jr., a longtime conservative activist whose clients have included the Republican National Committee, was the chief architect of the democracy-crushing Citizen's United challenge. Democrats Abroad issued a strongly worded statement condemning the efforts by Paul and Bopp. At first glance, a condemnation by Democrats Abroad may seem unnecessary, even counter-productive in terms of the best interests of those we represent, e.g. American citizens living abroad. After all, it is expats like us who are most affected by the reporting burden of FATCA. Why not repeal it? However, it is important to see this lawsuit for what it is, and how it can actually hurt efforts to find a solution to the unintended negative effects of FATCA. Rand Paul has always been an outspoken opponent of the IRS and fighting against FATCA fits well within his libertarian agenda. In this instance, he has chosen a target that he knows to be unachievable. Worse still, he suggests that he is fighting this good fight on behalf of all Americans abroad. If anyone may have been remotely convinced of his motivations, engaging Bopp as counsel must certainly indicate the motivations here are not simply to free middle class expats from the unfair reporting burden brought on by FATCA. 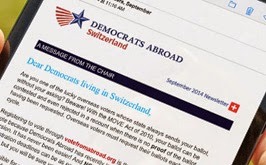 Democrats Abroad objects to the lawsuit as a distraction perpetrated in our name that panders to overseas voters, when our time and efforts need to be focused on an achievable solution such as a modification to the ruling text to include the Same Country Safe Harbor provision, providing significant and fast relief for the vast majority of Americans Abroad. The Safe Harbor initiative is not only attainable, efficient, bipartisan, and supported by three non-partisan organizations representing Americans abroad, but it is gathering momentum in Washington D.C., and it would be terribly unfortunate if this lawsuit were to divide attention or even derail the progress we’ve made. At present a very important bi-partisan “sign-on letter” is circulating on Capitol Hill, attracting signatures from members on both sides in both houses. Additional news this week is that a bill to establish a commission on Americans living abroad was introduced last Wednesday. These are the efforts that we need to know about and be focused on, that should receive the press coverage wasted on diversions brought to us by the likes of the Rand Pauls in government.